What to do with the spare room in your house can be a subject of much debate among a family. Often there’s a difference of opinion; would it be best turning it into an extra bedroom, just in case you’re likely to have guests stay at some point in the future? Or perhaps, off the back of a planned lifestyle change (or a waning new years resolution) you’re considering turning this space into a home gym? Of course, if you ask the children, the answer will be that – obviously – it should be re-appropriated as a games room or some sort of home cinema. But the most common and practical solution is to turn this extra space into a home office. Whether you’re a full time remote worker, own your own home-based business, or simply need a quiet space to gather your thoughts, installing a home office can be the perfect resolution. Cannadines now provides a full home office design and installation service. All our Hepplewhite fitted home offices are made to your exact specification, just like our fitted bedroom furniture. And the best thing is that you can take your time creating the ideal working environment for you. Everything from the desk, the chair, the keyboard and mouse, the shelving, the colour scheme…it’s all in your control! A better balance between work life and home life. Working from a home office can help you spend more time with your family, run errands that would’ve otherwise been done at the weekends, or even give you time to do some chores! Less stress and better health. A demanding work culture can be detrimental to your health. By having a more familiar environment that has been tailored especially for you, workplace stress can be greatly reduced. Avoid the dreaded commute. Work from a home office, and your commute is only a matter of a few steps from the bedroom! You won’t waste time travelling so no longer will you have to deal with traffic, roadworks, paying extortionate prices for petrol…and you can feel better about reducing your carbon footprint as well. Wear what you like! No smart casual dress code here – wear something comfortable. Greater productivity. With a quieter environment comes less distractions. No more office politics, getting sidetracked about conversations about last night’s TV, or having to take a regimented lunch break. You’re in charge of your time and how to use it to full effect. One of the best things about installing an office in your home is the freedom to design and decorate a workspace how you want it. Anyone can put a desk in a room and call it an ‘office’, but if you’re planning on spending a lot of time in there you’ll want to go a bit further than that! You’ll want to take into account shelving, drawers, filing and doors. 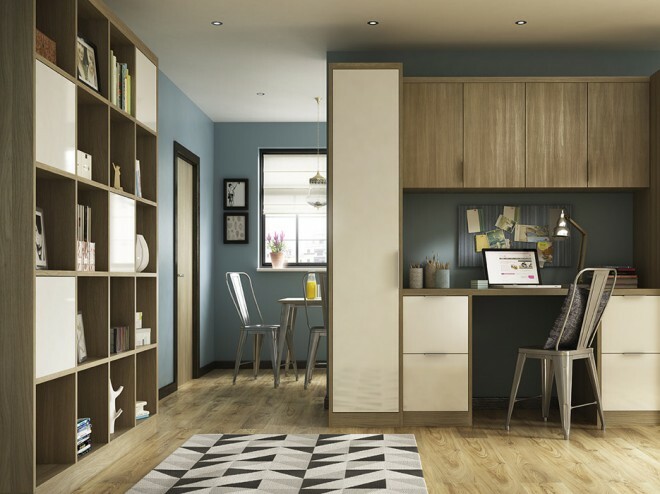 You’ll want to make the best use of every inch of space when fitting a home office, and have a place for everything you need. Your mood and productivity (and perhaps even your business revenue!) will depend on how you manage this, so take the utmost care when deciding how to set it up. Good lighting is critical in any home office installation. Otherwise, after spending a few hours plugging away working from home, you run the risk of eye strain – not a great help for your productivity! Moreover, having the wrong lighting setup can affect the overall feel and ambience of the room. If possible, you should let as much natural light into your home office as you can. It’s well documented that there’s a big difference in worker’s efficiency based on whether they’re subjected to natural or artificial light. You’re in your own home, not stuck in the dreaded office cubicle – so take full advantage of your ability to control the working environment! Don’t skimp on your chair. If you’re going to be spending a lot of time sitting on it, you’ll want a comfortable seat. Over 100 million working days are lost per year in the UK due to back pain. Don’t become another statistic and invest in your comfort. Get some greenery. A cheap way to transform the feel of a room, plants are proven to increase productivity and reduce stress. Choose the right space. If you haven’t got a spare room to turn into an office, can you find another area of the house for a working space? Wherever you choose, try to make it so you can close the door and shut out any distractions. Good for homework. A home office can still be used by the whole family, and can be an excellent sanctuary for children to crack on with their schoolwork. As noted above, Cannadines can help you get your ideal fitted home office. We can help you design and install everything you need to create a wonderful working environment, taking into account a range of stylistic choices.